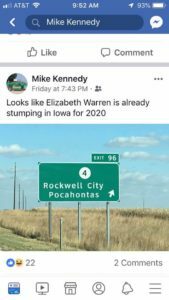 Nebraska Democratic leaders on Sunday decried as racist a Facebook post by Millard school board member Mike Kennedy that demeaned U.S. Sen. Elizabeth Warren — who has been been referred to by President Trump as “Pocahontas” because of her Native American heritage. Warren is mulling a run for president in 2020. Frank LaMere, vice chair of the Nebraska Democratic Party and a member of the Winnebago Tribe of Nebraska, said the post by the GOP board member was insulting.